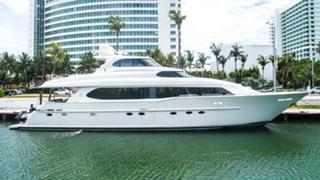 The 28.6 metre motor yacht Elymar has been listed for sale by Marcos Morjain at Reel Deal Yachts. Built in GRP by US yard Lazzara, Elymar was delivered in 2000 as an enclosed flybridge model and had a complete refit in 2018 including rebuilt main engines and a complete new paint job. Accommodation is for 10 guests in five cabins comprising a master suite, two VIP suites, a double and a twin. All guest cabins have entertainment centres, television screens and en suite bathroom facilities while the crew quarters sleep four staff aboard this yacht for sale. Rich earth-toned carpeting combines with camphor wood and lacquered joinery to create a warm and welcoming interior throughout while custom fabrics are used on all furnishings, valances and bedding. The saloon has an L-shaped upholstered sofa with throw cushions, two upholstered swivel barrel chairs, a bar with wine storage and an entertainment centre featuring a DVD player and a satellite television receiver. Forward is a dining area for eight guests around a circular wooden table and there is a custom overhead soffit with concealed lighting. Further forward is the galley featuring a raised breakfast nook, L-shaped leather seating and a drop-down television screen. Twin 1,480hp MTU diesel engines allow a cruising speed of 19 knots topping out at 24 knots and she is fitted with Trac zero speed stabilisers. Lying in Miami Beach, Florida, Elymar is asking $2,595,000.